I have been informed by the hubby that I am apparently obsessed with red velvet. I don't know where he gets these notions. Let's just not take into account I made these not too long ago, which was followed by the appearance of a nice pint of Ben & Jerry's Red Velvet Cake ice cream in the freezer. I still have no idea what he's talking about. 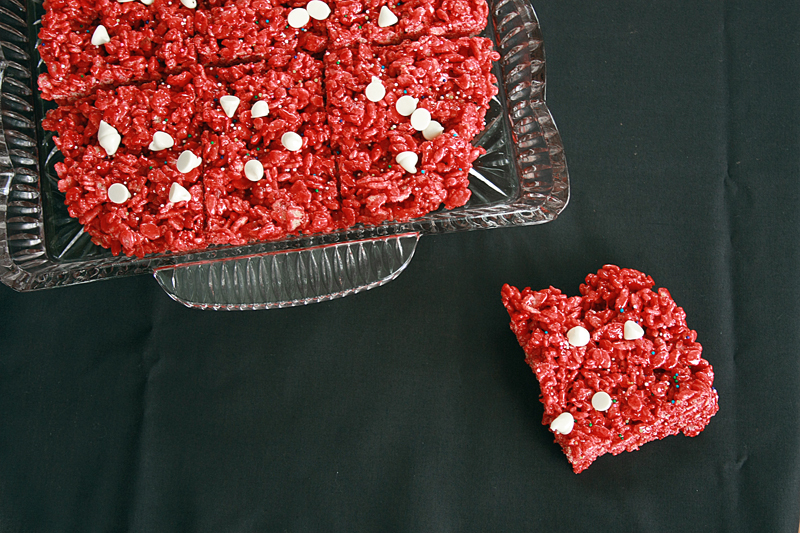 I made the original version of these Cake Batter Crispy Treats over the 4th of July with my sister when we found out at the last minute we were going to a party. Quick and easy is what we needed, and this recipe totally delivers. I was slightly disappointed in the lack of cake flavor that came through in the end. It was a little sweeter than normal, but it wasn't screaming "cake batter!" to me. So what else to do but add more? And why not make it red velvet while we're at it. Because, well, supposedly I have a thing for it. Or something. Line a 9x13-inch pan with wax paper; coat well with cooking spray. Set aside. In a large saucepan, melt the butter over low heat. Add marshmallows, stirring frequently, until melted. Stir in vanilla and cake mix until fully combined and no lumps remain. Stir in cereal, making sure it is well-coated with marshmallow mixture. Transfer Rice Krispie mixture to the prepared pan, pressing down until the top is level. Top with sprinkles and drizzle with melted white chocolate. Despite the shockingly red color, once again the whole cake flavor didn't really come through as expected, even though I doubled the amount of cake mix called for. Hmm. Either way, it's still a Rice Krispie treat, which means it's still scrumptious. Even when you take them outside in 500 degree heat to take pictures and they start melting all over again. Except for those dang white chocolate chips. Which refused to melt for anything. Not in the microwave, and not on the stove top. Odd and frustrating at the same time. Oh well, they work just fine sprinkled on as whole chocolate chips too. I wonder if adding powdered buttermilk would help? Or maybe a little extra cocoa powder? 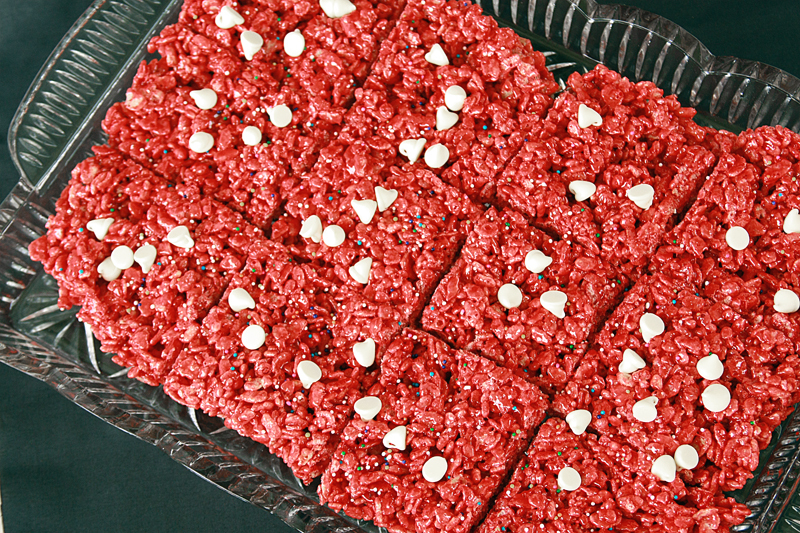 I love rice krispie treats.... they look super yummy in red. Embrace the obsession! Zomg these are so cute. Looks awesome, red velvet rice crispie is a first for me. They look pretty, even if they don't taste too much like cake! And who doesn't live a rice krispie treat! Yay! Absolute love for these. I think the white chocolate chip problem might be the amount of cocoa butter in it. It's probably a low percentage. But that's okay because they're still great just like they are :-) I LOVE a fabulous Rice Krispie Treat, too! Even though they didn't turn out exactly how you wanted them they look fabulous and I am sure that they still tasted fantastic! Those look beautiful, and I must try them! The problem with your white chocolate chips is that they're baking chips, and therefore specifically designed to maintain their shape. Look for white chocolate that says "melting" on the package. Good luck next time you try! I get what you mean about the cake flavor not shining through. I experimented with red velvet treats and because I wanted it to taste "red velvety" I added a thin cream cheese icing and chocolate chips throughout. It ended up tasting really good! You already know how excited I am about these! I went out and bought some krispys later that day and will soon will be trying these babies out. Whoa. 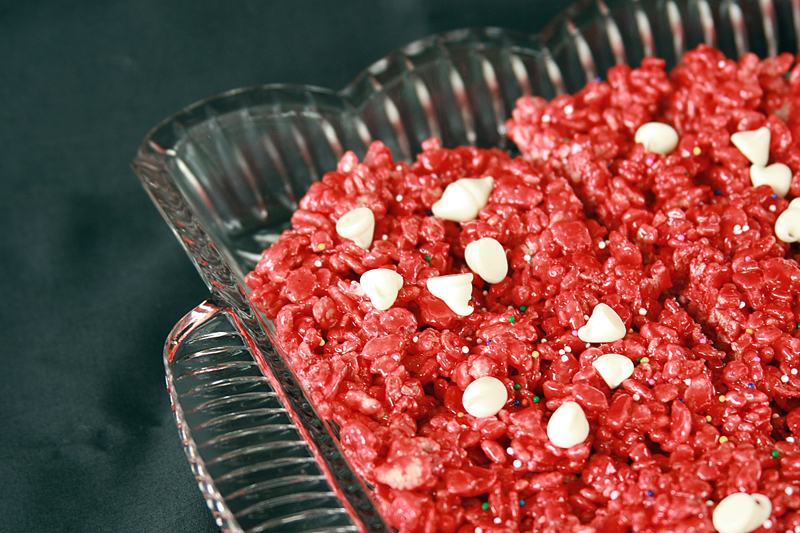 Red velvet in a rice krispie. Genius! here. They were awesome! Thank you for posting the recipe. I just made these!! They look amazing!! I used the 4oz of Hersheys White Chips and used 1 tbs of canola oil mixed in as I melted them in the microwave! Turned out awesome!!! Thanks for sharing this recipe!